Get inspired by real parents and kids who changed their eating and exercise habits to become healthier and happier overall. More than 54 million American women have high cholesterol (200 mg/dL or above). Joshilyn Jackson, 41, a novelist from Powder Springs, Georgia, used to be one of them. 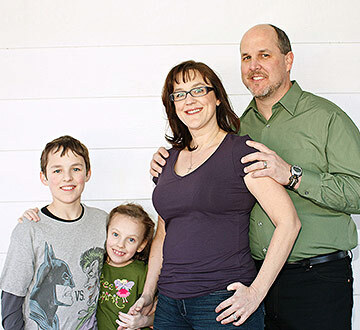 By giving herself and her family a healthy makeover, Joshilyn lowered her cholesterol from 200 mg/dL to 144 mg/dL in about three months, lost 15 pounds and got her kids to eat more good-for-you foods. These small changes made a huge difference. 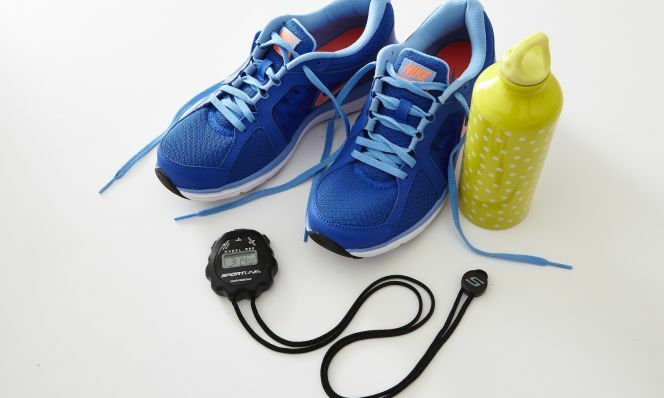 Make Exercise a Daily Habit I now work out almost every day, but I have to vary my routine to keep it interesting. I've tried it all—long walks with friends, group fitness classes, Pilates, weight lifting, and even a cardio boot camp at my church. Get Active Together My energetic kids—Sam and Maisy Jane—are great motivators. We hike through state parks with other families, and my husband and son go bike riding. A great trick to get the kids moving: Instead of scolding them for little slipups, like leaving a light on when they exit a room or not cleaning up, I have them run up and down the stairs. Eat More Heart-Healthy Foods I try to get plenty of protein with egg whites, hummus, and grilled chicken. I also love salmon and avocados, which have healthy fats. And for a treat before bed I grab a handful of dark chocolate-covered soy nuts. Make Cooking a Family Affair On a regular basis I ask Sam and Maisy to choose a meal and help prepare it. For extra motivation, we bought them each a healthy children's cookbook. Jennifer Osborne, 37, struggled with her weight, blood pressure, and cholesterol for years. When she turned 35, a combination of family health scares (which gave her a glimpse of her future) and the influence of her husband and two daughters, ages 14 and 5, compelled her to do something about her risky stats. Jennifer made some dramatic changes—she lost 63 pounds and lowered her blood pressure and cholesterol to optimal levels. Once she got healthy, she realized she had the tools to help others do the same. Get Started My dad has diabetes and my father-in-law had a heart attack in his 50s. I realized that could be me in 10 years. I want to be there for my kids when they get married and have their own children. That's why I started exercising regularly and changed my eating habits. Walk It Off My daughters love when we take walks, ride bikes and play kickball together. Ciera sees how great I feel after exercising so she encourages me to walk around the neighborhood with her. My goal is to run as fast as she does. I work on my speed on the treadmill. After a five-minute warm-up, I bring the incline up to level four and walk for five minutes, then lower it to ground level and jog for three minutes. I repeat this for an hour. Eat Healthier I joined Weight Watchers and learned tricks to improve our diet. We switched to brown rice, whole-wheat pasta and whole-grain bread. Instead of chips or cookies, I give my girls yogurt, string cheese, frozen grapes, or veggies with ranch dip for snacks. Lose Weight Too My husband has followed my lead and now eats oatmeal and a banana for breakfast and drinks water or tea instead of soda. I inspired my mom to lose 53 pounds by limiting processed foods, measuring servings, and cooking fresh veggies and lean protein. I also post my favorite low-cal snacks and workout tips for my friends on Facebook. When her doctor told her she was obese, Lanie Dixon, 36, was shocked. She knew she needed to lose weight but didn't realize her body mass index (BMI) a measurement of weight in relation to height was so high. An ideal number is between 18.5 and 24.9; 25 to 30 is overweight; above 30 is obese. Lanie's was 37 so she was scared and determined to make changes. 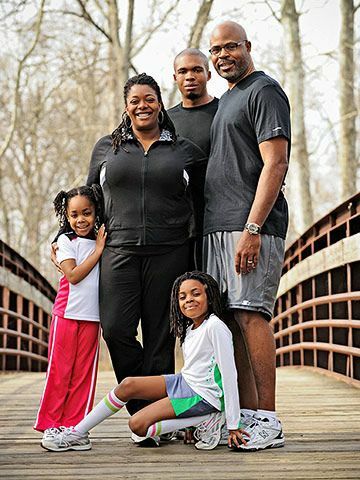 Supported by her husband and kids, Lanie lost 30 pounds and reduced her BMI by 5 points in a year. Her updated goals: Drop 35 more pounds and run a half-marathon (she's already done four 5Ks). With her new diet and exercise routine, she's on the right track. 6:30 a.m. My first workout of the day is right in my bedroom. Nike.com offers a series of 1- to 3-minute yoga, cardio, and strength-training videos. I do a total of about 35 minutes. 8:30 a.m. I prepare an easy to-go breakfast. My favorite is two egg whites, with one slice of turkey bacon and a half of a slice of Swiss cheese, on an English muffin. 11:30 a.m. At lunchtime I usually eat a veggie-packed salad with field greens, spinach, romaine lettuce, tomatoes, cucumbers, and 1 tablespoon balsamic vinegar. 1:00 p.m. My e-mail calendar reminds me it's time to get moving (I set it to send me an alert every afternoon). I grab a co-worker for a 30-minute, 2-mile walk circling the office building. 4:00 p.m. After work I head to an exercise session for parents held by my daughter's school. It includes Pilates, kickboxing, aerobics, and line dancing. 5:00 p.m. As soon as I get home I snack on a cup of Special K cereal with some skim milk. It keeps me from munching while I cook or overindulging at dinner. 6:30 p.m. The whole family sits down for a healthy meal, usually a lean protein with two veggies. I make a starch for my kids, but I typically skip it. A favorite of mine is baked tilapia, roasted asparagus, and black-eyed peas. 9:00 p.m. The kids have learned to expect and even like fresh fruit or Jell-O for dessert. I sweeten it up just a bit with a little whipped cream on top. Originally published in the May 2010 and June 2010 issues of Family Circle magazine.